It was a wet and windy day when we arrived at the Self Build & Design Show 2019 and a long overdue recce to the East of England Arena and Events Centre, Peterborough and what a pleasant surprise it was – easy to find, well signposted and plenty of parking not far away from the show entrance. So a good stress free start to the visit. A nice welcome from the designated meeters and greeters with a show pack not too overloaded with literature so left plenty of room for picking up items. The Show opened at 10.00am and the aisles were already filing up at 10.15. In fact I spoke to one exhibitor and by 11 o’clock they had already taken 14 very good enquiries so it looked as if this was going to be a busy day for all the exhibitors. Insulation solutions provider Kingspan was there along with other big brand names as such as Oakwrights, Bosch, Potton and kloeber as well as the NSBRC and Build Store, plus many others offering a range of products and services for enthusiastic self builders. Bookable Ask The Expert sessions were filing up early with visitors keen to have some of the expertise of a range of consultants and specialists covering Design, Construction, Planning, Finance, Architects and Passivhaus Design. The majority of visitors to the show are aspiring self Builders doing their research and plot hunting although according to David Olver, Account Manager, Self Build and Design many do come to the show with plans for their dream project. 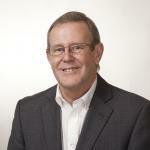 The general consensus is that the quality of visitor and leads is excellent. Exhibitors also include designers, project managers, with some of these groups also coming as visitors. 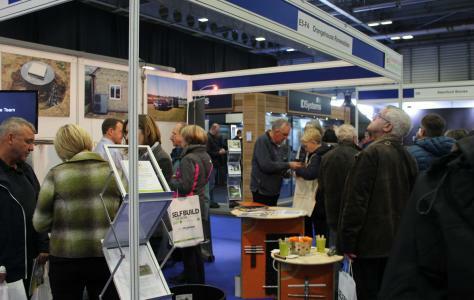 An interesting point that David made was the self build events tend to work best on a regional basis which results in customers/visitors being much more engaged in the self build and design process rather than some of the more generic large homebuilding shows. This probably explains why the Show had such a pleasant vibe with exhibitors understanding each other’s part in the self build process. 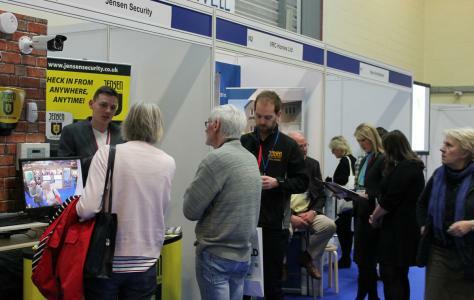 This was an opportunity for self builders to talk the self build talk with exhibitors without fear of getting trapped! A Government briefing paper, Self-Build and customer build housing (England) predicts the self-build market is expected to grow steadily by around 7-10% per annum to 2020. This goes some way to explain the appetite self builders have for events such as the Self Build and Design Shows. There is no doubt that self builders are totally committed to carrying out thorough research into the options available to them. This was a very friendly focussed show with over 60 exhibitors in one hall it was easy to get a real feeling that the exhibitors were there to talk and advise rather than just sell which made it much more enjoyable. When it came to leaving it wasn’t just with a bag of literature but some professional advice from experts in their field. Finally, in the words of Ross Stokes, Editor, Self Build & Design magazine “It is worth remembering that a quality well-built home is something that should not only serve you well, but future generations too”.